Imagine if BLADE RUNNER, ROBOCOP and THE TERMINATOR were all rolled into one, but the film was directed by a young Michael Bay and written by someone who had written only adult films. Sounds bizarre, right? It is. But it’s also incredible! 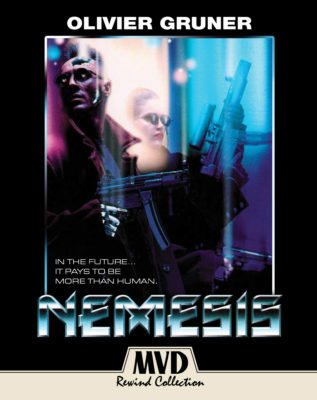 Released by the MVD Rewind Collection, the 1992 cyberpunk sci-fi film NEMESIS centers on a tired LAPD cyborg cop (Olivier Gruner of ANGEL TOWN, another MVD Rewind Collection release) who is sent on a mission to find his cyborg partner and lover (Marjorie Monaghan). But really this movie is just nonsensical action. A collection of set-pieces where men in business suits and sunglasses shoot every gun and bullet ever made. It’s awesome! Don’t get me wrong: NEMESIS has terrible dialogue (often hilarious for the wrong reasons) and frequently feels like it was recorded later and added in. So the words don’t always seem to match their mouth. But none of that really matters because the action is what counts. 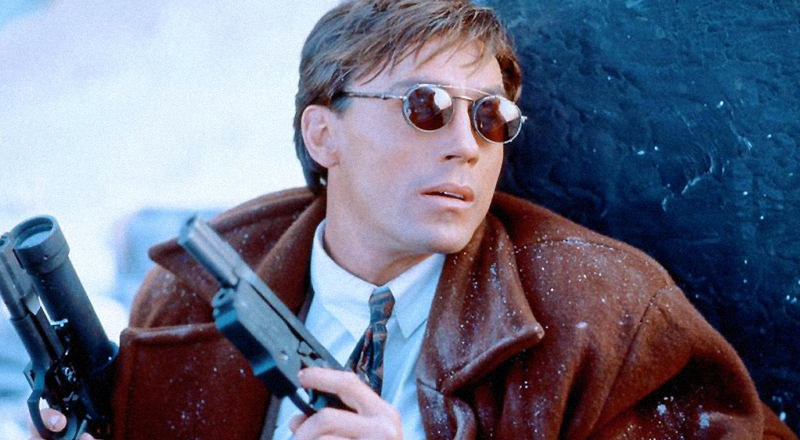 Director Albert Pyun, who directed the equally-as-ridiculous and fun CYBORG with Jean-Claude Van Damme, knows how to be inventive when it comes to action. The camerawork alone — when a character is shot and the camera acts as the bullet, or when Gruner shoots out the floor to escape his doom — is some of the best I’ve seen. There are stunts and practical effects that are on the same level as MISSION: IMPOSSIBLE – FALLOUT, a bold statement, I know. But seriously, Pyun was taking chances and really crafts a fun action film. And the MVD Rewind Collection restores this film to near-perfection. Extras: The MVD Rewind Collection release (available today through mvdshop.com) includes a slipcover for the VHS-loving age (complete with a “Please Rewind Me” and “Adult Action” sticker) and a collectible poster. On the Blu-ray disc, we have an in-depth interview with Pyun, where he discusses how the story began and changed over time, how he managed to shoot at the settings he did, and his relationship with the cast. There’s also a new interview with producer Karson and a director’s commentary. The DVD comes with much more, including a making-of, introductions, a hilarious “kill count,” photo gallery and different cuts of the film. The best title to own this week is the 1976 Brian De Palma romantic mystery OBSESSION — and go figure, it’s directed by De Palma (CARRIE and DRESSED TO KILL) and written by Paul Schrader (TAXI DRIVER and FIRST REFORMED). The film begins on an eerie note: Married couple Michael and Elizabeth are celebrating their 10th anniversary. All of a sudden we see the butler walk into frame, revealing a gun. Later Elizabeth and her daughter are kidnapped, leaving Michael to try get them back by paying a $500,000 ransom. However, he allows himself to be talked into a dumb scheme by the police, which ends with Michael’s family getting killed. Or … that’s what Michael thinks. 18 years later, Michael takes a business trip to Italy and finds a woman who looks exactly like his wife, the same she did 18 years ago. The rest of the film is a romance, but audiences should keep in mind that this is a Schrader script, meaning shocking things happen. OBSESSION is a movie that goes against the grain and pushes its ideas to the extreme. I found myself thrilled by the kidnapping portion and completely intrigued by the mysterious love story. If you don’t expect too much from this film, De Palma delivers a grand film worthy of owning. Extras: The Scream Factory release (available today through shoutfactory.com/shop) includes a slipcover, a new audio commentary with author Douglas Keesey, a new interview with producer George Little and editor Paul Hirsh, OBSESSION revisited featurette, a theatrical trailer, radio spots and photo gallery. Now if you really want to see a movie that is truly bizarre, watch HOWLING III. This comes from a director (Philippe Mora) who isn’t afraid to be straight up weird. I mean, there’s a scene where a mother werewolf (Imogen Annesley) gives birth and puts her baby in her pouch in the most disturbing fashion. But how it’s put together is also one of the strangest things I have ever seen. Thrown together almost at random, the film is about an Australian scientist (Barry Otto) who discovers that marsupial werewolves exist, one of whom acts in horror movies. Released on Blu-ray by Scream Factory, HOWLING III is for those who are franchise completionists or collectors of left of center horror films. Things just happen in the movie. There’s no rhythm or rhyme to it. Each scene feels like it was directed by someone else and that someone didn’t even bother to watch the previous scene. It needs to be seen to be believed. Extras: Available today through shoutfactory.com/shop, the Scream Factory release includes a lengthy discussion with director Philippe Mora (this interview earns the Blu-ray most of its points by delving into the fascination of Tasmanian Tiger and the director’s reservations of making a sequel), a new audio commentary with Mora (I recommend this more than movie itself), vintage interviews and a theatrical trailer. 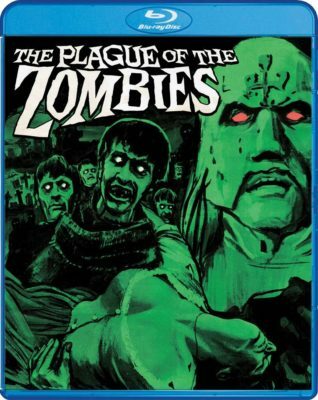 THE PLAGUE OF ZOMBIES involves voodoo rituals, people coming back from the dead and one man’s sinister plot. Like a lot of Hammer Horror, there’s a lot of English people talking with words that sound made up or taken from an old edition of a thesaurus. But there’s also some great visual effects and makeup, especially when you consider the film came out in the 1960s. So, expect to be bored at times and spooked during others. Overall, it’s a great watch for historical purposes. They even show the zombies working like Oompa Loompas. It’s crazy! Extras: The best thing about Hammer movies that are repackaged on disc is they tend to include really deep analyses from film historians. This Scream Factory release (also available today through shoutfactory.com/shop) comes with two new audio commentaries, a fun featurette where they give you a restoration comparison, a making-of, a World of Hammer episode, a theatrical trailer and a still gallery. There’s also reversible cover art.